Call Nicola at 208-867-9462 or email her. Thank you Jesus for taking my place on the cross! Nicola’s Pets is located in Buhl and Boise, Idaho. However, we serve Meridian, Nampa, Caldwell and the entire Treasure Valley. We are also willing to arrange delivery of our puppies to clients outside of the state of Idaho, contact us for details. Having a dog is an amazing experience for anyone. Dogs are very loyal to their owners and are always there by your side and provide you with endless amounts of love. Looking for someone to love you unconditionally? “GOD” spelled backwards is “DOG“. God loves you unconditionally and so do dogs! Why buy your puppy from Nicola’s Pets? Here you have discovered a reliable Christian company that breeds Teacup Yorkies, Biewer Yorkies & Morkies locally in the Boise, Idaho area. We are dedicated to breeding healthy, happy, intelligent, non-shedding, Toy breed puppies, with good conformation and temperaments. Our puppies are raised as part of our family right in our home. The puppies are extremely well behaved and are kept clean and pampered. Owning a new puppy is a big decision. You have to be prepared to take care of your new puppy over a long period of time. There are year-round tasks like purchasing food, taking the pet to the veterinarian, and maintaining appropriate shelter. 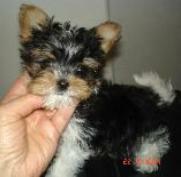 A new puppy will also count on you, the pet owner, for love, companionship, and exercise. Our puppies are also very well socialized and come with a 1-year written health guarantee (6 months on adult dogs). We can verify that we are not a Puppy Mill! 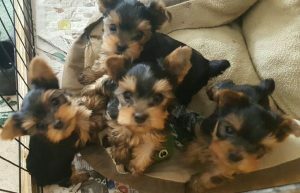 Our company, Nicola’s Pets, is proud to offer AKC Yorkshire Terriers, AKC Maltese, BYA Biewer Yorkies and designer dogs for sale; and has been an Idaho dog breeder for 34 years & counting! As you look around our website, discover that our puppies are fine animals produced from healthy, fully-certified parent dogs. When you purchase a dog (for breeding or showing) from us, you are certain that your new Yorkie or Maltese will have an American Kennel Club certification; and if you purchase a Biewer Yorkshire a’ la Pom Pon, they will have Biewer Yorkie Association registration. We also provide pedigrees to show that there is no inbreeding. We do DNA testing on all our male stud dogs to further the superiority of the breed and assure no faults. De-worm and vaccinations are up-to-date on all puppies. We also offer Canine Stud Service for all breeds. We don’t sell a new puppy to prospective puppy owners unless we’re sure the animal will stand up to your high standards as a pet consumer. That’s why you should bank on our 1-year product guarantee. If you aren’t fully satisfied with your purchase, we will take the necessary steps to fix the situation. We want you to be a happy, satisfied client. By making sure you are thrilled with your new pup, you help us to add to our reputation as first-quality Teacup Toy puppy breeders. Our Toy Breed small dogs serve as ideal companions for people who spend a lot of time at home. They are also friendly playmates for kids. Teacup puppies, however, are generally too fragile for small children because they can be dropped or injured easily. 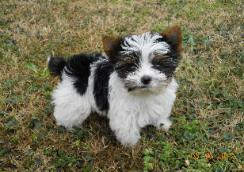 When you need to find the right puppy breeder, rely on the services of Nicola’s Pets. We look forward to building a long-term relationship with you by helping you choose one of the fine animals listed on our website. At any time of the year, we are happy to answer your questions about your Toy dog ownership. For instance, puppies make great gifts when they go to homes where people can care for them properly. We want to thank you for researching our company. You will see why we are reputable breeders with many satisfied customers. We will gladly talk to you personally about which breed would be the best fit for you. We also offer “out-of-area” delivery options for those not in the Buhl, Idaho or Boise, Idaho areas. We encourage that you meet the puppy personally or have a family member, or a representative acting in your behalf, meet the puppy prior to delivery. Previous Buyer references are also available upon request, and all puppies are veterinarian checked! To see currently available puppies click here. Please do not copy our images. If you want an image of a puppy, please contact Nicola for permission.